← Keurig Tip: DON’T wait for the “De-scale” warning to come on! Mocha Latte is the R rated version of chocolate milk. I say that because Moca Latte has a smooth creamy favor. It has a yummy mouth-coating quality that lingers like a melting malt ball. It’s a kid’s dream, thick and luscious with a flavor so fat it hangs like a froth mustache on your upper lip. But moca has some forbidden qualities as well. It has the very grown up nip of a dark roasted espresso and a nutty fullness that wins out over the sheer sweet that children would prefer. Most kids I know would take a sip and then stick out a tongue in defeat. So close, but yet so far in children’s terms. But a nice mocha can be just the ticket to the adult tongue. But what has all this frothiness have to do with Keurig? Drop in a cup and get a cup of coffee – no froth allowed. Or is that actually the case? 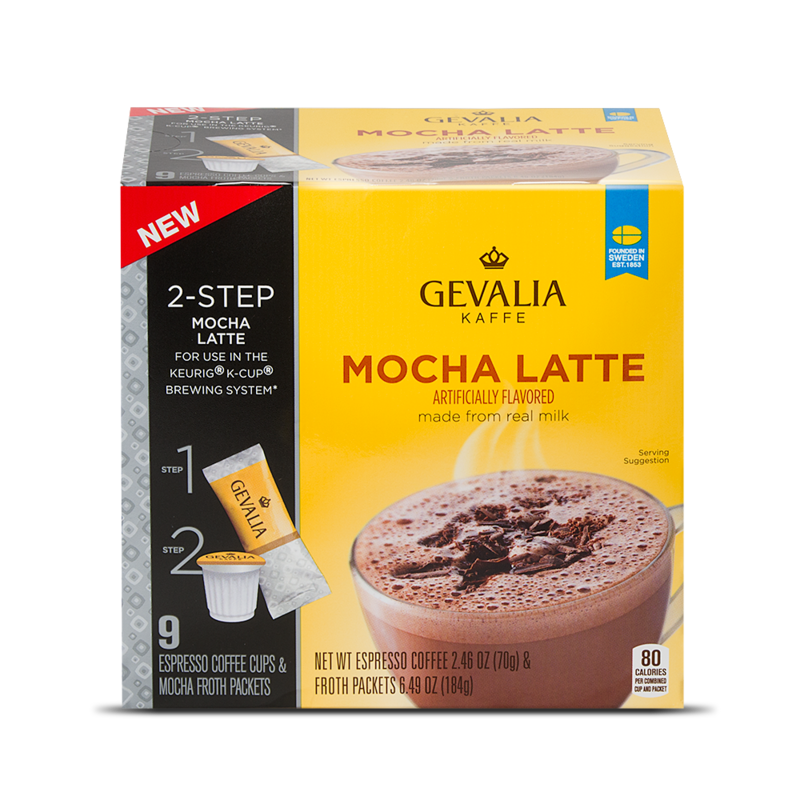 Keurig gets complex with Gevalia’s Mocha Latte 2 part kit. Gevalia, who has entered the K-arena with some wonderful coffees, as introduced a 2 part kit for preparing a frothy cup of moca latte. The kit consists of a powder packet that is poured dry into the bottom of the coffee cup. Then a quite ordinary looking K cup is placed in the holster. With the machine set to a medium cup size, the hot water passes though the coffee …. and magic takes place. As the hot coffee hits the powder, a reaction occurs. The powder in the cup begins to pop and sputter to life, creating a blanket of foam about a half inch thick. As a man who grew up in the United States, I am reminded of a popular candy called “Pop Rocks” that would sputter and crack once exposed to whatever corrosive qualities my saliva contained. You can give it a few stirs with a stick or a spoon to mix in all the powder, and you wind up with a cup of mocha latte that looks and smells pretty good. There’s still a few pops and cracks, but that fades quickly leaving a nice cup of foamy drink. A little squirt of canned whipped cream makes this an impressive looking treat. 1. It is NOT truly frothed whole milk with lots of fat and all the things that make a latte like this stick to your ribs, among other places. 2. It is NOT Cremora on steroids. It has a true coating quality that offers the impression of something containing significant milkfat. There’s mocha flavoring in the powder as well, and while it isn’t overhelmingly “malted” it is a pleasant taste that works well with the brewed coffee. 3. It is NOT an uncompromising replacement for a coffee house mocha latte. You want the real deal, you’ve got to put on your coat and go get it or invest in a whole lot more equipment than a Keurig. 4. It is NOT expensive in calories. Gevalia clams 80 calories per serving. You have to stay away from any extra sugar or whipped cream to stay on that target. 5. It is NOT expensive in money, relatively speaking. At the time of this writing, Amazon.com was selling in bulk (36 cups) for 1.22 a cup. compare this to 4-6 dollars for a store made beverage and it’s a good deal. Compare it to a nice, simple cup of really good Joe and yeah … it’s a bit of extra change. Gevalia did very well with this tricked out powder and K-cup combination. It is a worthy, quick and easy cup that you can offer a guest or whip up for yourself. It is a great way to avoid a fattening desert and it will leave you feeling quite happy that you’ve had something naughty to drink. 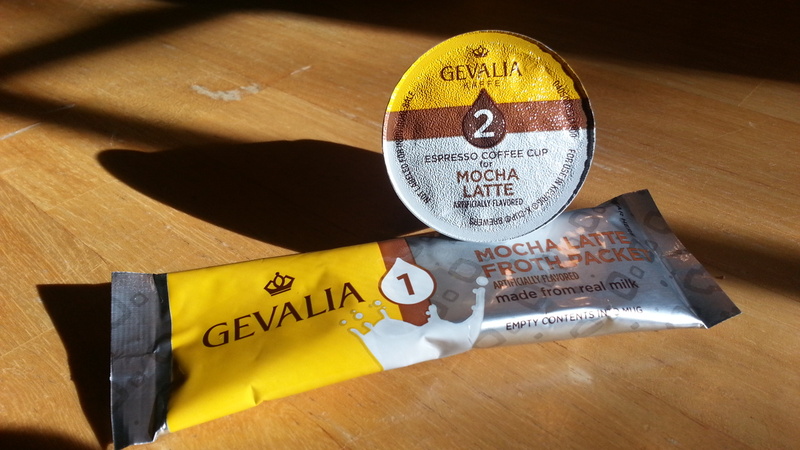 The Coffee Whisperer recommends Gevalia’s Mocha Latte for Keurig! This entry was posted in Brewing Coffee and tagged coffee, espresso, froth, Gevalia, Keurig, mocha latte. Bookmark the permalink. I love both your coffee and the froth packets are wonderful. I would like to order just the froth packets. Is that possible? Thank you! Doris, thank you for visiting and commenting here! I believe Gevalia doesn’t sell the packets as a individual item, you have to buy the full kits. However, using it with other coffees does sound interesting. By the way, this site is not affiliated with Gevalia in any way. We’re just coffee fans like yourself. Thanks. I have purchased the Gevalia caramel latte and it didn’t seem to be brewing the espresso cup. It was coming out clear or partially clear. I contacted Gevalia and they sent me a voucher for a new one. This time I got the Mocha latte and it is doing the same exact thing. I have followed directions completely and still does not work correctly. All other coffee K-Cups I use have no problems. Did you experience this with yours? Erik, this behavior seems odd to me. I can tell you that the actual stream of brew leaving the Keurig seems lighter than an espresso style brew, but it is difficult to assess the strength of the coffee since it is immediately mixed with the frothing powder. A point to check is to make sure you’re using the correct brew setting, which is the “small mug” size. Another point would be to give the cup an enthusiastic shake before placing it in the machine. If other K-cup coffees work correctly in your brewer, it’s hard to imagine there’s a specific problem with the Gevalia cups. It may be the brew is weaker than you expect and might not be to your taste. Thanks for writing. I had bought like 4 boxes of this brand gelatin in a month..I can’t seem to stop drinking this coffee esp. They have different brands. One of the best things they made and sell in stores. ..almost as good as coffee shops.. I have plenty of K-cups but am running out of froth packets cuz I sometimes use the froth packets when I need to brew a large amount of coffee for a crowd. WHERE CAN I FIND JUST FROTH PACKETS WITH NO K-CUPS???? I love all the kinds. Do you know what is in the froth packet. I I really don’t know what exactly is the froth packet, but I would guess it is some sort of artificial creamer product that will hold a froth. I’ll try to do some research and see what I can come up with. Great review. I just discovered this, and oh, boy. So good! I think I’ve made a mistake sharing it with my teen daughter. Her eyes lit up when she tasted it. Now i have to share.